U-6 Unemployment Rate - What Does It Mean? 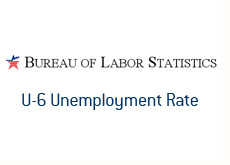 What is the definition of "U-6 Unemployment Rate"? The Bureau of Labor Statistics releases a bunch of different unemployment numbers every month. The unemployment number that is most often used in the media (and by the government) is known as the "U-3". This number was 8.1% in February of 2009. The "U-6" is considered to be a broader measure of the unemployment situation in the United States. 1. "Marginally attached workers" - people who are not actively looking for work, but who have indicated that they want a job and have looked for work (without success) sometime in the past 12 months. This class also includes "discouraged workers" who have completely given up on finding a job because they feel that they just won't find one. 2. People who are looking for full-time work but have to settle on a part-time job due to economic reasons. This means that they want full-time work, but can't find it. Two pretty important groups of people, no? The "official" unemployment number is the "U-3" - this was 8.1% in February. The "U-6" was an eye-opening 14.8% in February.